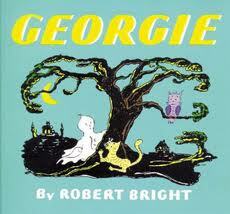 No Halloween book list would be complete without “Georgie” by Robert Bright. Written in 1944, Georgie features not only the gentle little ghost from the title, but the wonderfully spooky illustrations by Bright himself. Georgie lives with the Whittakers and provides them with a little ghostly routine of a creaky floorboard and a squeaky parlor door. But when Mr Whittaker decides to fix these, where does that leave Georgie, who really doesn’t want to scare a soul? This vintage Halloween tale has been delighting parents and children for more than 60 years and should take its rightful place on the bookshelves of families for 100 more.